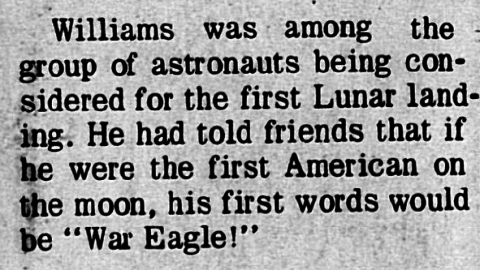 Astronaut Clifton Williams (Sept. 26, 1932 – Oct. 5, 1967) was hoping to make one giant leap for Auburn Kind. 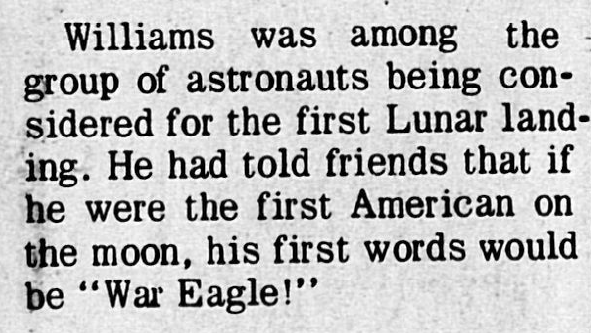 That’s the Plainsman remembering Clifton C. Williams, one of the first of Auburn’s many contributors to the space program, in its July 25, 1969 issue, the first published after Neil Armstrong did his thing, which he did exactly 43 years ago today. He was on the backup crew for both Gemini 10 and Apollo 9, and was later included in the list of candidates for the first moon mission. But he never made it into space. Williams was killed on Oct. 5, 1967 while piloting a NASA T-38 jet trainer. He was flying from Cape Canaveral to Mobile, his hometown, to see his father who was dying from cancer. Wikipedia says the plane crashed. The Plainsman says it exploded in mid air. 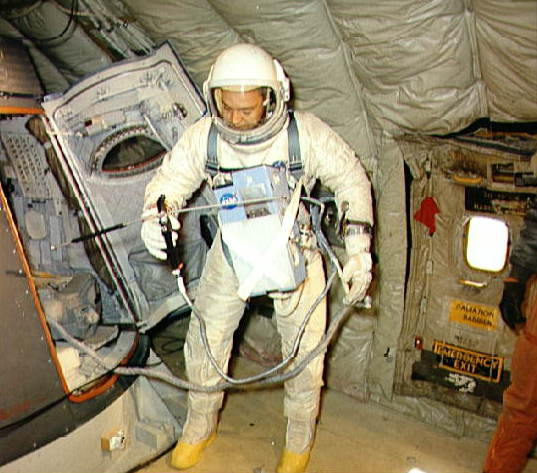 Williams training as Gemini 10’s backup pilot aboard a KC-135. 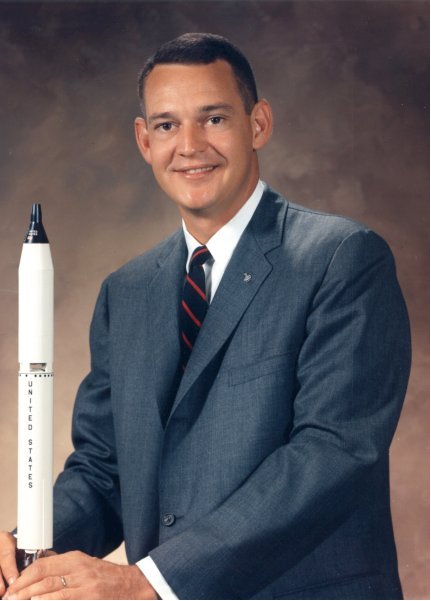 At the time of his death, Williams was the lunar module pilot for the crew that eventually became Apollo 12. Related: Auburn student watch Apollo 11’s splashdown. I, for one, think that nothing beats Neil Armstrong’s line. That mission was about mankind, surpassing everything mundane (yes mundane) like college, sports, even family maybe. Maybe Clifton Williams, after seeing the whole world in front of him might have just changed his response after realizing the impact of what had just happened. We will never know though! I think “The Eagle has landed” would be replaced with “War Eagle has landed” or something, but not (One small step…). It was scripted by NASA. I dunno, “War Damn Eagle, Beat Bama” has a certain timeless ring to it.